From the majestic Ohio River to a mundane cup of coffee, these amateur and professional photogs really know how to capture Louisville’s best angles. With 2016 (finally) in the rearview, it’s time to focus all the good, great, and greatest things that happened around town. So check out some of the finest photos from this past year that captured what locals love about Louisville: our city’s beauty, weirdness, and its people. Downtown and the Mighty Ohio river. 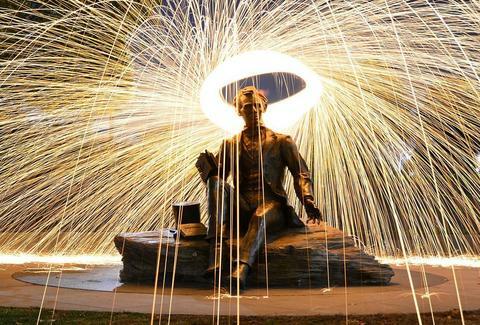 A spray of light and magic over the Abraham Lincoln statue in downtown Louisville. Louisville’s best drag queens assembled at Play nightclub to raise money for the victims of the Pulse nightclub shooting in Orlando. Here’s looking at you: The View of the Louisville skyline from across the Ohio River. GO CARDS! : UL vs. FSU. Made a new bestie at the Louisville Zoo. Arts-and-Crafts Hunter S. Thompson looks over the crowd at Louisville’s Forecastle Festival. Night shot, from the outside looking in at the newly remodeled Speed museum. “Gray sky over muddy river,” new bridge and old bridge. Keep your head up: Crown modeling at the Palace. Fleur de lis ornaments at Red Tree gift shop. Skate or die at Louisville’s beloved skatepark. A quiet moment at the Gospel Missionary Church. Seen #aroundlouisville, a classic car cruising past Caffe Classico on historic Frankfort Avenue. Minda Honey has 1.2M unseen selfies maxing out the storage on her iPhone. Send help: @mindahoney on Twitter & Instagram.